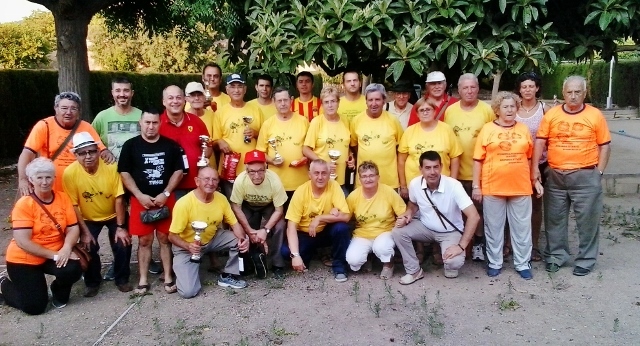 You have heard me go on about my petanca and read the blogs after the competitions, but this is something different this is a celebration of one clubs 25th anniversary. 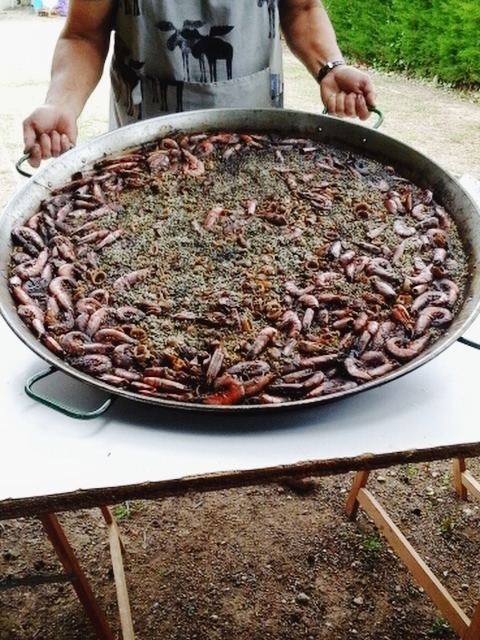 Tivissa Petanca Club was 25 years old this year, and we were invited to join them for a “black rice paella” celebration. 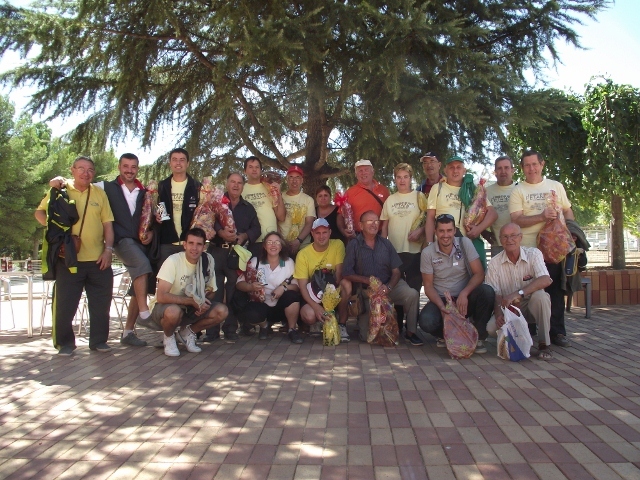 The Petanca club is well supported by the community and the Alcalde (mayor) is always present to hand out prizes at the petanca events. Tivissa is an old town with a long history. 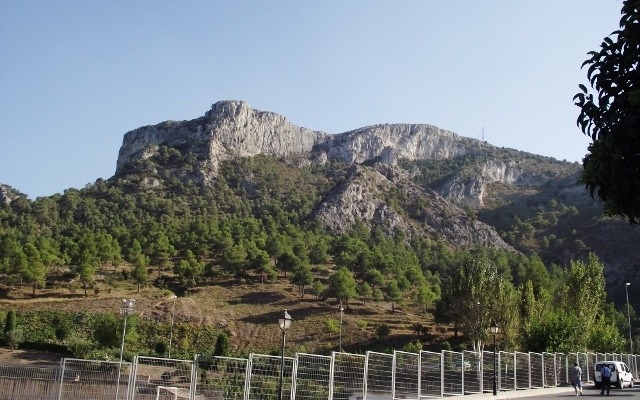 It is nestled beneath the La Llena massif which when viewed from the petanca courts is both fascinating and precioso. It has a lot of historical features dating back to the Iberian period and a church within a church – that is really interesting to see. 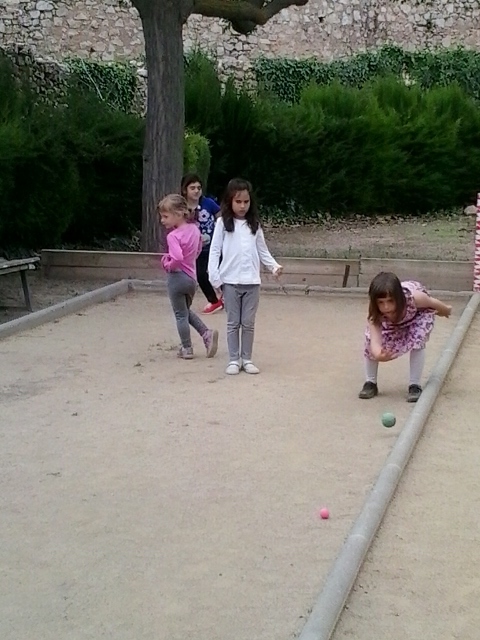 It also has some of the best petanca players. 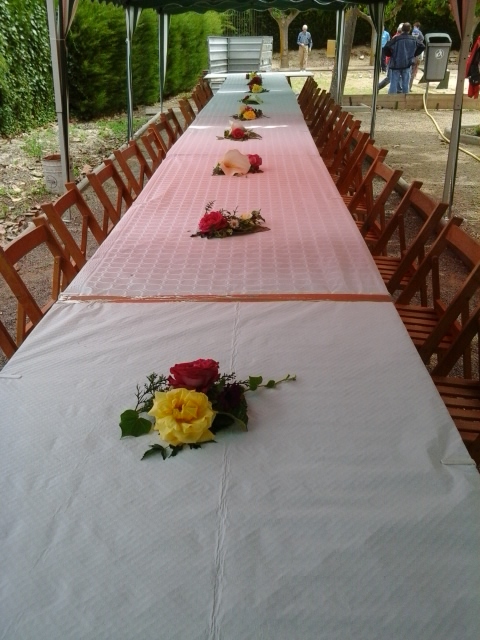 On the Saturday we arrived to find the tables decorated with flowers and set up under canopies. 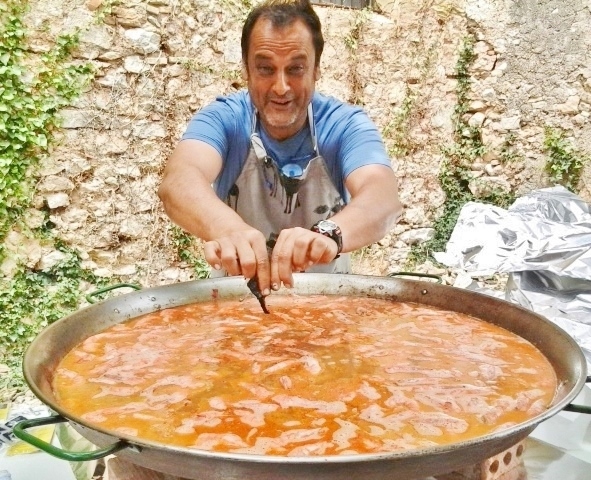 The chef was busy preparing the paella with – as you can see – a happy smile. 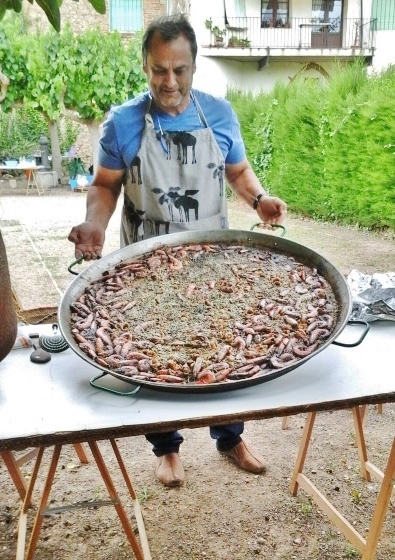 There is a definite art to making a paella, and it is usually a man who is in charge of this event. There are two types of paella here a sea food one which consists of prawns, mussels, small cockles and pieces of squid. 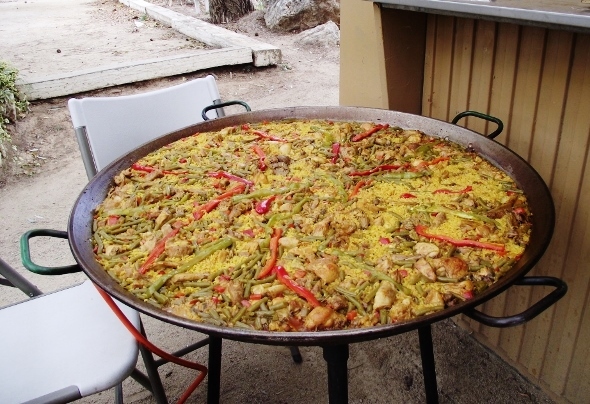 The other is a country paella, which is mainly rabbit, chicken with sometimes pieces of pork, basically any meat that is available. 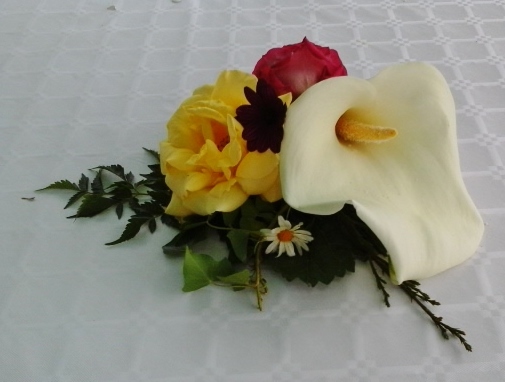 On the tables were flowers roses, lilies and daisies which came from Ramon’s garden. 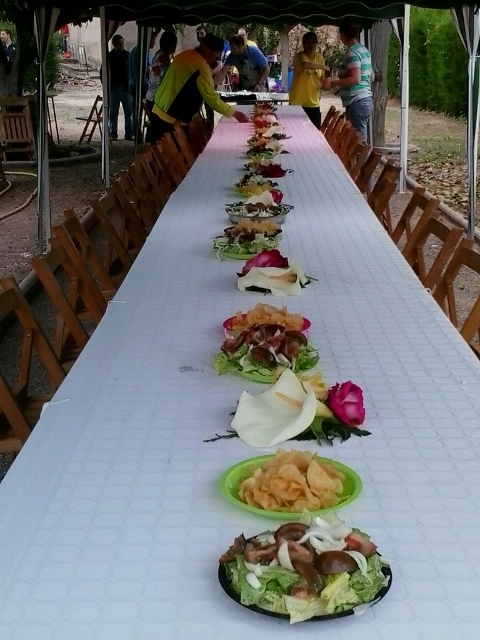 In between these were placed plates of meat, crisps, olives, salads and other tid bits, a real summer celebration table. Although not shown here water, lemonade and of course wine was in plentiful supply which made for a happy, relaxing meal with friends. 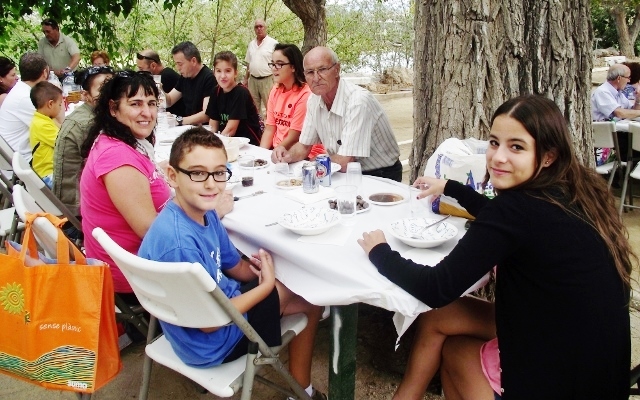 This is a family club where they encourage the younger members to enjoy Petanca, and before we adults got down to some serious eating the youngsters enjoyed something to eat and drink before going to play. 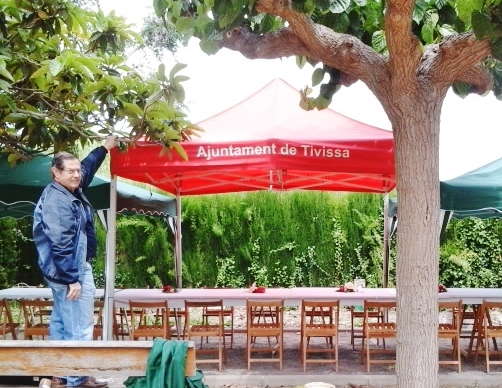 A big thank you to our friends at Tivissa Petanca Club for making us welcome, and letting us share in their celebrations. 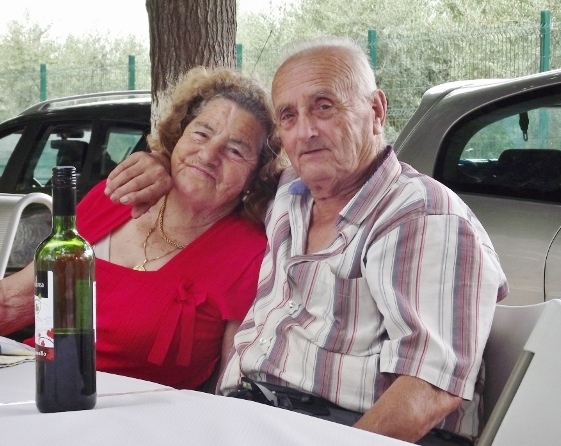 We would normally spend a petanca paella, sitting down to eat in good company and sunshine, however, today was to prove an exception of sorts. 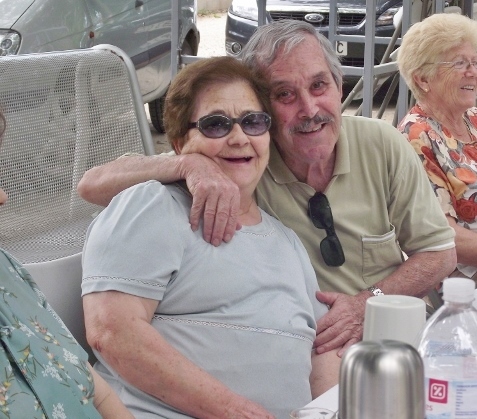 For a start, we had been looking at the weather – el tiempo – for the past two days and according to the tv we would be up to our armpits in water oh yeh??? This morning arrived in full sun warm and promising a lovely day with no clouds in any direction and as we could see down the valley we made the usual remarks about pity it was raining so much or we wont have to drive down with all this rain we can float…. should not have said anything. We spent the morning tidying up and fiddling about to pass the time – we did not get up until gone 10 o’clock as I was watching the football on tv then the Godfather 2 till late. Anyway I decided to have a lie down before we left – it’s a requirement as there is plenty to eat and drink and a few games afterwards – so I was a little surprised to find it getting cloudy with large white clouds that were giving way to varying shades of grey appearing over the mountains. 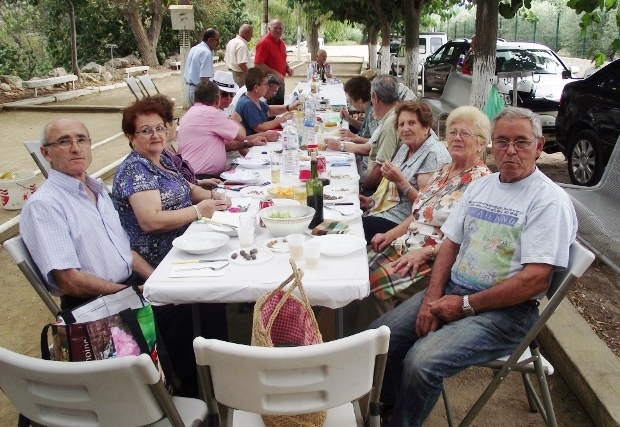 Still we have a club house so I was not worried we have had the paellas in there before, we are a versatile lot here. 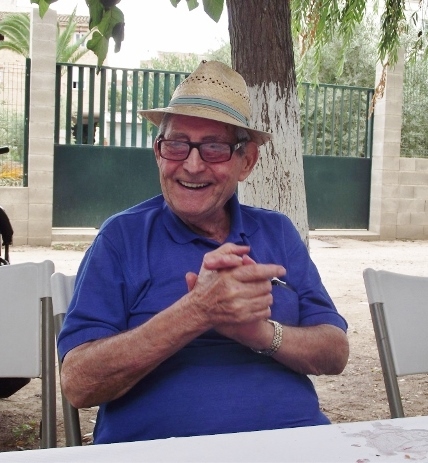 So once rested and washed I was handed the bag with our dishes, forks, glasses – for vino – a bottle of wine and lemonade plus the obligatory roll of paper towels -and we set off for town. 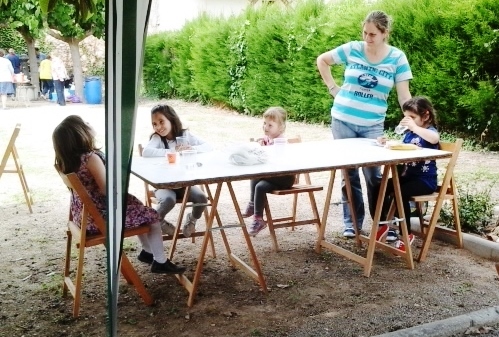 It was getting grayer as we drove into town but the tables and chairs were set up out under the trees then the sun came out. This was more like it, however this did not last long and I think the weather report might have put quite a few people off as there were not many there, but those who were were good company and good friends. 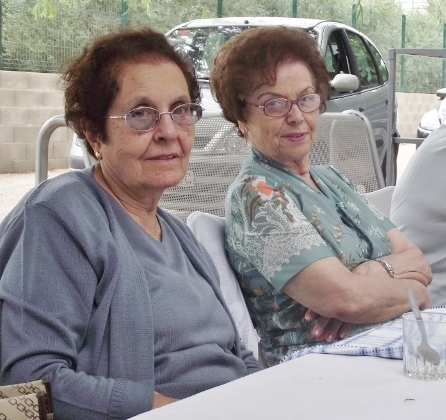 We found our spot at the table and whilst I went to chat with my friends my wife went to the shop for one or two bits to go with the lunch, crisps, cakes and apricots. Then we all settled down to the traditional country paella of rabbit, chicken, peppers and rice cooked to perfection as always by Hosea. 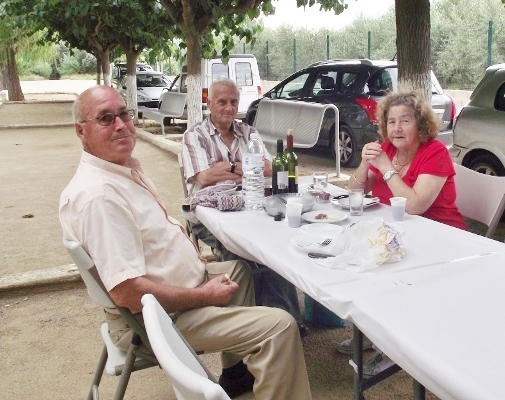 It was whilst we were on the last course the water melon and coffee – the coffee was passed round from various flasks – that the first spots of rain were felt. During the conversation no one had noticed the clouds getting thicker and darker, but just one not so dark and dense was the one that tinkled on us. 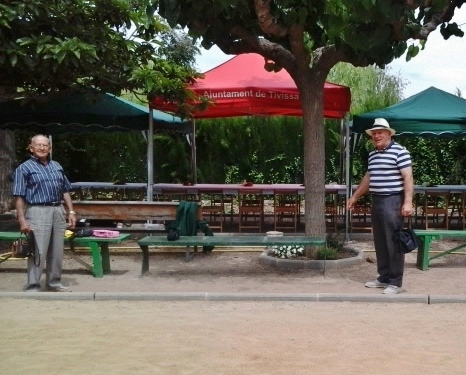 Well that was that, we went from laughing at the remarks of the women about our petanca prowess to being told by an army of female organisers – my wife included – to get out of their way and with in a few minutes the tables were cleared so we men could stash tables and chairs away all neat and tidy. I looked around but everyone had basically gone, so it was really annoying to find that 10 minutes later it stopped raining and as I write the sun is out. Can’t trust the weather man can you lol. So no pictures were taken however here are some of the best from past meals just to give you an idea of the fun we usually have. 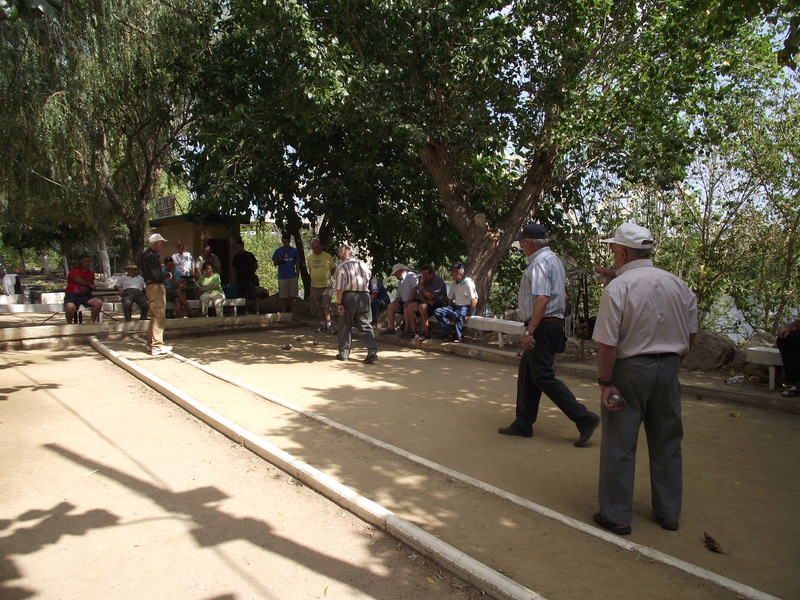 So hopefully the next one will be like this good company and friends lots of sun and a few games after, oh and I must remember to take a flask of coffee next time…..